Peaches have to be my absolute favorite fruit to eat fresh in season and I’m starting a love affair with browned butter. It is tempting to substitute it in every recipe calling for plain old butter. That rich, nutty flavor is enchanting, and is perfect paired with a sweet, juicy peach. Even though I love the juicy, fresh flavor of a good peach, that flavor is hard to use in baking. It’s a mild flavor that easily gets lost in the sugar and butter. 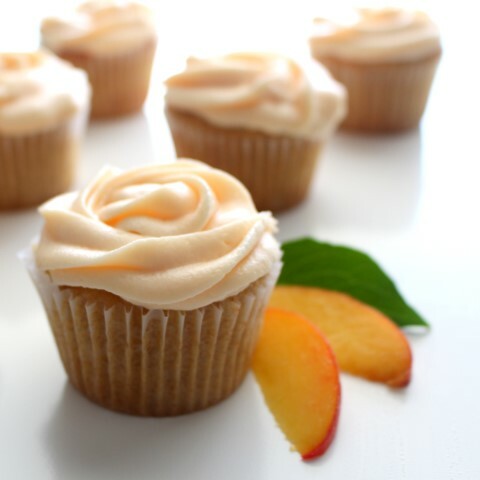 My first attempt at making these cupcakes with peach puree ended in failure when the overflowed the cupcakes tins and lacked any peach flavor at all. After further experimenting, I added chunks of peach into the batter along with the peach puree, this gives a burst of peach flavor in each bite and highlights the peach flavors in the batter. 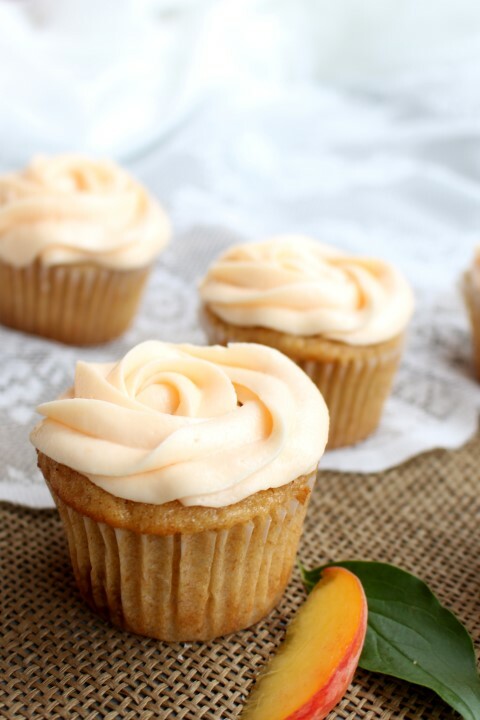 Again there is a bit of peach puree in the frosting, but it only leaves a hint of peach flavor behind. 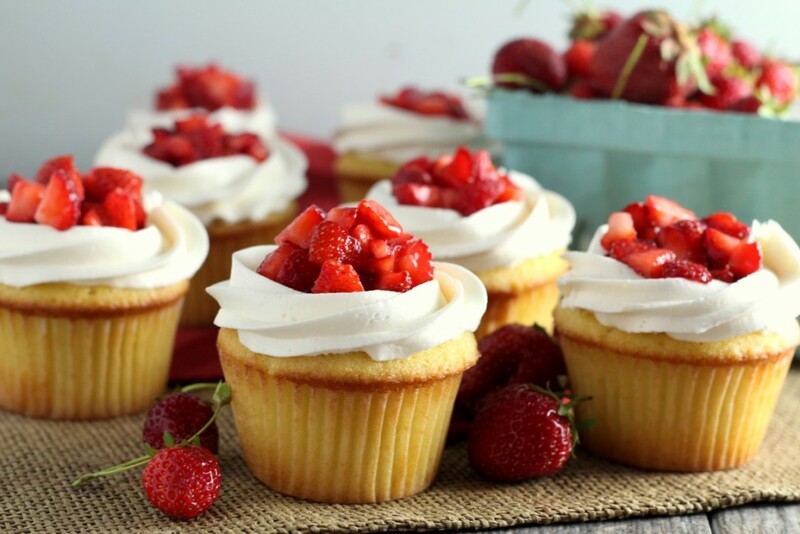 Though it is a perfect compliment to the tender cupcake. When frosted in a rose pattern, these cupcakes make a perfect desert for summertime showers and brunches. Brown the butter in a small saucepan over medium heat, stirring occasionally. Remove the butter from the heat and pour into a separate heat proof bowl to stop the browning. Cool completely. Preheat oven to 325 F. Whisk together the brown butter, peach puree, brown sugar, white sugar and vanilla. Beat in eggs. In a separate bowl, mix together the flour, baking powder, salt and cinnamon. Gently stir into the large bowl along with diced peaches, mixing until just combined. Fill lined cupcake tins 3/4 full. Bake for 20 minutes or until the spring back when lightly touched. Cool completely on wire racks. *To make Peach Puree, heat 3 cups of diced peaches, 1 T lemon juice, 1 T water and 1 T white sugar in a saucepan over medium heat. Bring to a boil and let it simmer for 5 minutes, stirring frequently. Remove from heat and let cool to a warm temperature. Blend in a blender until smooth. Cool completely before use. Wow – these are gorgeous! 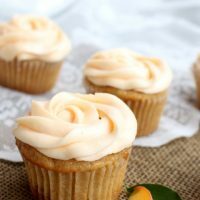 Love the extra peach chunks and peach puree in these – and the rose petal frosting – simply gorgeous! I love this, anything brown butter is on my list of awesomeness. Mallory these are fabulous!! So pretty and I LOVE this flavor combo. I’m so trying these before all the peaches are gone!! Stopping by from Wake up Wednesdays. Wow! That recipe for the peach frosting sounds amazing. Pinning! I just bought a crate of peaches yesterday. What a beautiful way to bake with them! Thanks! Peaches are one of my favorite summer fruits, and this is such a great way to use them! I love the addition of the brown butter. Pretty cupcakes! 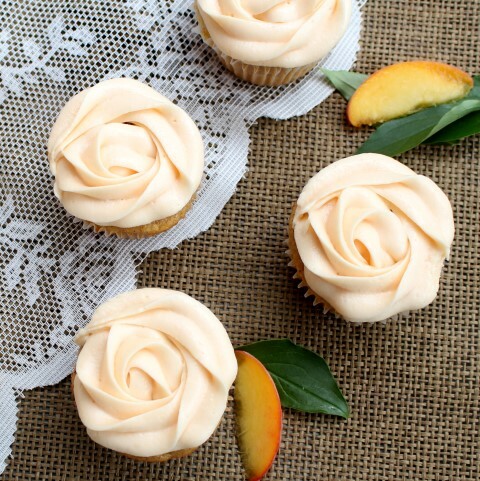 Such pretty cupcakes and I’m loving the summer fresh peaches! Thanks for linking up with What’s Cookin’ Wednesday! These look lovely! Novice question here: do you peel the peaches for the puree or leave the skin on? I would recommend peeling the peaches first. I made these tonight and the flavor is amazing! However, the cupcakes fell and we’re extremely gooey and wet, falling apart. The batter itself looked normal though before baking. These are so good that I want to try another batch tomorrow night. I followed the recipe to a Tee though. After eating one baked, it’s almost like the wasn’t enough flour. Trying to find where I messed up. Thoughts? Thanks, these are worth getting right! It’s nice to hear from you, Megan. While I was testing them, I made a batch that were wet, gooey and fell too. I tried the recipe again, adding more flour and they turned out okay for me, which is the recipe I have posted. So I would say try adding a bit more flour as well. I’m going to make them again and see how they turn out for me. Thanks for the comment! These are AMAZING!!! I just made them, and oh my GOSH, the brown butter makes all the difference. I personally will add a bit more diced peaches next time; but other than that, SUCH a great recipe! I will definitely be making these again and again. So, what I have to wonder, does the 3 cups get split into the batter and icing. Or all 3 cups in batter and another 1:2 cup in icing? How long do u brown your butter for? Are we talking dark brown, or just a tent of brown? Thanks looking forward to making these! I brown it pretty dark, just a shade before burnt. It all depends on the flavor you want and I like a strong brown butter flavor. However, make sure the butter isn’t burnt, because burnt butter is pretty terrible. Hope you enjoy! Your cupcakes look and sound delicious! I am about to make them but that seems like a lot of butter to me. How many cupcakes does this make? Most recipes I use make about ~30 cupcakes and use ~1/2c butter… what does adding more butter do? Can I decrease the butter? Thanks! Thanks, Tasha. I know this is a lot of butter, but that is the amount before it is browned. Browning the butter reduces it and shrinks all the fat particles down so it’s not as much as you think. I would recommend sticking to the amount in the recipe. But if you don’t mind a failure or two, you can always experiment. I made these cupcakes several times before I got the right ratios. Hi Jessica, I’ve only kept mine overnight and they were still good the next day. I can’t vouch for longer than that. That sounds like a fun birthday party! I wanted to make these cupcakes and noticed that you had two different amounts posted for the brown butter in the cupcakes. Hi Megan! Thanks for pointing that out. For some reason I had two version of the recipe posted. I’m not sure what happened there. I removed the wrong one! Happy baking! Hi, I just wanted to say that I’ve made your recipe today and it was the best muffins recipe I’ve ever made! seriously, thank you very much… Except, I have replace the butter with the same quantity of unsweeted apple sauce and put a bit of litchys in the puree. It was perfect! If I want to use regular butter and not the browned butter. How much should I add. Also instead of browned butter can I used clarified butter. I’ve never substituted regular butter in the recipe so I’m not sure. Mans I’m not familiar with clarified butter either. This may be a dumb question but are you just browning the butter for the cupcakes or for the frosting also?! I just browned the butter for the cupcakes. But browning it for the frosting would be good too! Can you make the puree days before mixing it with the ingredients for the frosting? I’m making the cupcakes for Friday and it’s Tuesday. Would these work well if I left out the cinnamon? They sound so good but I despise cinnamon and find that it’s too overwhelming for me to put in any recipe (no one on earth agrees with me haha). Can’t wait to try this recipe! How did you make the rose shape? I’ve been out of decorating for a couple of decades and this doesn’t look like any tip I have….how did you make it sooo gorgeous? So, I am making these for my son’s first birthday this weekend but I was wondering if it is possible to adapt the peach puree to home canned peaches? My peaches are canned in a simple syrup and I didn’t know if that sweetness would effect the amount of sugar that goes into the puree. I’ve never tried it, but it may work. I would just make sure the peaches are very well drained. The cupcakes are delicious! But the frosting is a bummer. The flavor is good but the texture is all wrong-foamy and runny, not smooth and creamy. I think 1/2 cup peach purée is way too much. I can’t imagine what I did wrong, the instructions are simple and I’ve made frosting a hundred times, but advice is always welcome. Thanks for the cake recipe, that alone is great. Just made these and they were a huge hit! I just made these and the peach cake recipe is amazing! But for the frosting, I added the powdered sugar up to six cups and it still didn’t get to the right consistency… too runny to frost the cupcakes. I made this recipe for coworkers birthday. The timing was right, she loves peaches and I picked up a 1/2 bushel of peaches on my way home from the beach last week. Everyone at work raved about them. Looks like I’ll be making the recipe again this weekend! Thank you! ps. As far as the frosting goes, I used about 5 cups of powdered sugar and it turned out perfectly. I assume that the ripeness may affect any frosting issues? Mine were JUST ripe enough and there wasn’t a lot of extra liquid in the pan after heating. What temperature do you bake these? Has anyone tried to make this as a cake? I would love to try it as a birthday cake. Thank you! I tried these today, they fell and were gooey. Second batch baked at 350 on convection, better but still fell a bit. Made these and they were delish! I had to cook them longer (approx 4 extra minutes), but they were moist and a little on the dense side (my preference) and super tasty. I didn’t make the frosting because I had leftover Swiss meringue buttercream from another cake, so I just mixed the extra puree into that and it worked beautifully. In the future, I might add a little peach extract or schnapps to boost the peach flavor of the frosting, but everything else was perfect!